If you were thinking of visiting Dulwich Picture Gallery today, forget it. The gallery will be closed to the public all day for a royal visit in recognition of its educational and outreach work (title link). The Prince of Wales will be visiting in his capacity as President of The Prince's Foundation for Children & the Arts. 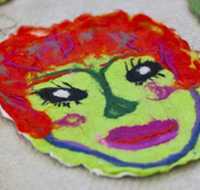 He'll be bringing the wife, Duchess of Cornwall, and Kate, Duchess of Cambridge, to view the kiddie artwork on display.